LAURUS - Citta dell' Aqulia. LAURUS, J. - Citta dell' Aqulia. Citta dell' Aqulia. - LAURUS, J. Title : Citta dell' Aqulia..
Map maker : LAURUS, J.. Size : 15.1 x 20.2 inches. / 38.3 x 51.2 cm. 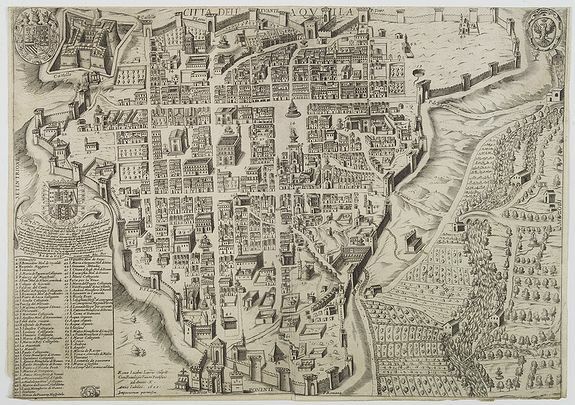 Description :Rare and early plan of L'Aquila in central Italy. Condition : Upper margin cut 1mm. into the engraved area. Short left, right and lower margins, as issued. Some marginal fraying of paper in left and right bottom corners. Good and dark impression.